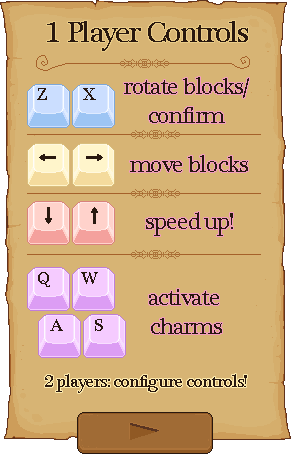 Before going into battle, players can equip up to 4 different charms, special spells that aid in matching up tiles, destroying victory hearts, and tripping up the opponent! Every charm does something unique, and your play can vary wildly depending on your favorite charms to use in battle. you're playing the game! woohoo! Most menus can be navigated with your mouse. just point and click! if you're playing the crude text demo, you can use 'Z' to move dialogue forward!